The 2018 Perfect Game Minor League All-Star Team is the 13th of its kind, starting back in 2006 which has essentially served as a preview of the players ready to make their impact at the Major League level. The team collects the best annual performers in the minor leagues, players that attended a Perfect Game event while in high school. Corey Seager, Carlos Correa, Kris Bryant, Javier Baez, Clayton Kershaw, Mike Trout, Paul Goldschmidt, Anthony Rizzo, Mookie Betts, Buster Posey, Madison Bumgarner, Joey Votto, and Gerrit Cole have been honored during that time and are among the game's brightest stars. The Rays, Twins, Angels and White Sox each have two first-teamers. The Rays, White Sox and Braves have the most total players mentioned with three each, while the Blue Jays and Padres each have two players recognized. Both Kyle Tucker and Danny Jansen are returning to the first team for the second straight year, while Peter Alonso and Eloy Jimenez move up from the second team (Jimenez also made the second team in 2016). This is the third year that Stephen Gonsalves has found himself on the first team after being honored in both 2015 and 2016, while second team DH Tyler O'Neill was also honored as a first teamer in 2015-16. Of the 30 players nine of them (Jansen, Lowe, Tucker, Toussaint, Sheffield, Gonsalves, Kramer, Dean, O'Neill) were called up to the big leagues. 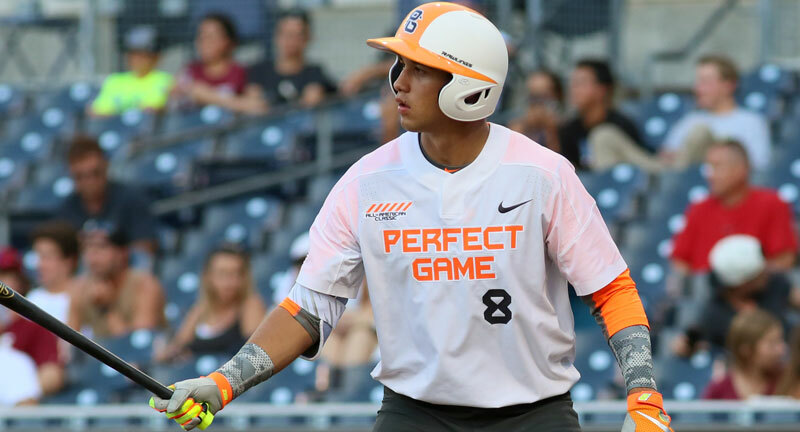 Of the 15 first team all-stars, 10 have previously played in the Perfect Game All-American Classic (Gorman, Lux, Kirilloff, Adell, Tucker, Cease, Tousaint, Sheffield, Gonsalves, Sandoval). Two of the second teamers (Waters, Anderson) have also participated in the Classic. Nolan Gorman is the only player listed that was drafted this past year, making his professional debut at the Cardinals Rookie affiliate before being called up to the Midwest League. Gorman was named the MVP of the 2017 Classic by driving in four runs, two of which came on a booming two-run home run.